Finally, I've gotten back to the "side by side" larger lake pieces. 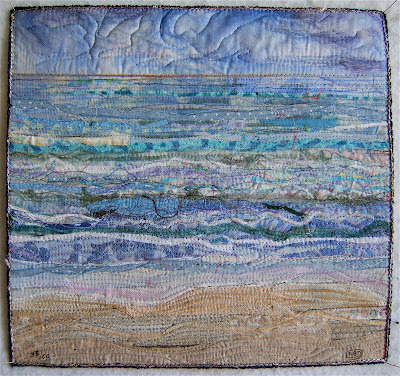 Lake #41 - 17"x 14"
Now to decide where it fits with the first two. I constructed it in relationship to the others on the far left. 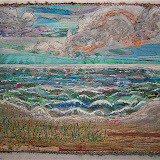 However, the new piece looks more like the lake at noontime. Usually the winds get calm in the middle of day. 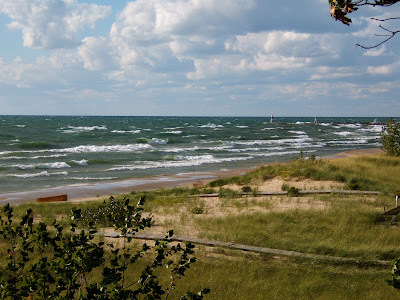 Plus, the lake is brighter and more blue with a high sun. 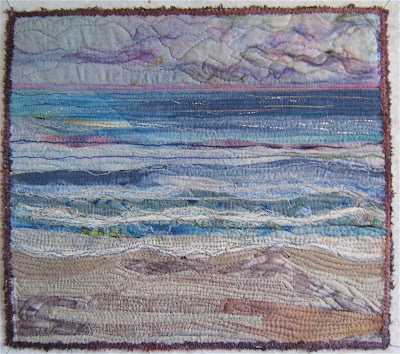 Also, the rising sun hits the crests of the waves and the beach in the morning as in the center piece. Consequently, the new one found its place between the first two I made. I do believe in "listening" to the work "talk"... from its telling when it is finished to this situation of where it belongs in relation to others. I wish there were words to pass onto to you how that works, but it's just a feeling ... an intuition ... a voice in my head that suddenly says "that's enough" or "that's right". Judy and I were working in the studio and my husband, Lee, was engaged in a tennis match on this particular morning. Cousin, Ed, was at loose ends. 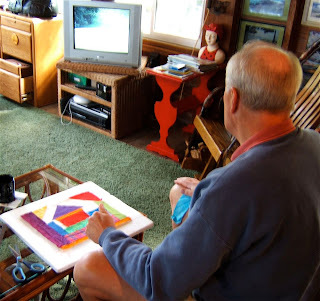 He paints canvases with acrylics and had expressed interest in how my lake pieces are created. So, I prepared a foundation and gave him a bag of scraps to play with while he watched a golf tournament. 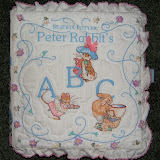 Here's his charming creation after I had machine quilted it. Give the gift of joyous approval. Accept all comers for what they wish to become. Understand and grant other styles and approaches. Realize the sun doesn't rise and set on academics. Feature others rather than yourself. Bask in the sunshine of others' success. Treasure the miracle of friendship. Lee's cousin, Ed, and his wife, Judy, visited the cottage this past week. 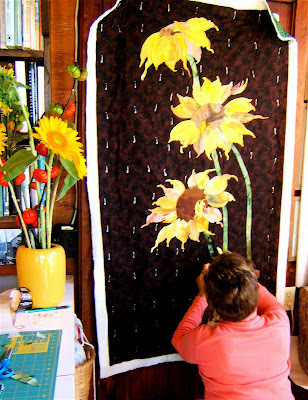 She brought the sunflowers that had been constructed in a workshop with Phil Beaver * to make a wall hanging as her project in my studio. Usually we "play" one day a year at the cabin we rent in Colorado while our husbands go off into the mountains. What a treat to get to play together for days. 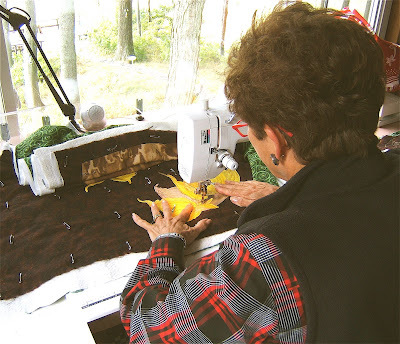 Judy had previously hand-painted the fabrics and glued the petals together to form the flower heads. 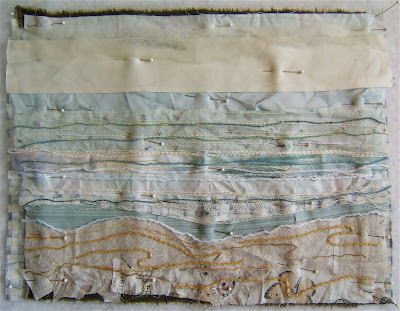 Here they're pinned in place over the background fabric on the design wall. 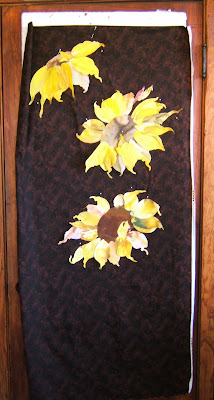 The sunflowers were adhered to the fabric with a spray adhesive. 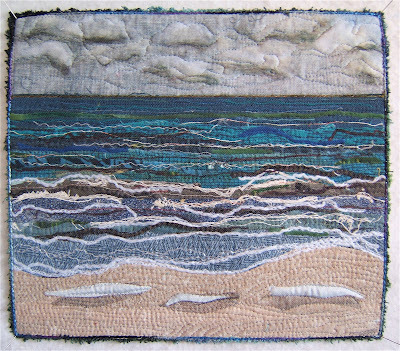 Judy machine quilted the raw-edged appliques. 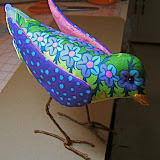 Then decided where the stems should be placed between the flowers and the vase (fabric painted by Phil Beaver). You can see that vase in the next photo. I happened to have the perfect hand-painted green fabric for her stems and she learned my technique for couching yarns on the them. 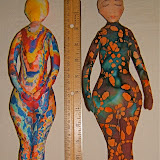 (It, along with a number of other hand-painted pieces, had just been gifted to me by my friend and neighbor, Mary.) Note the sunflowers that we got at the farmer's market as a physical reference ... as well as a decorative bouquet. There are "pumpkin peppers" growing on one huge stem among them. Judy got quite a bit done this week. I'm sure she would've finished if we hadn't had to leave the studio to play with our husbands now and then ... and to make meals or dine out. 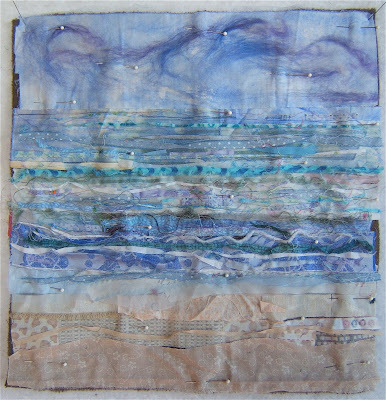 *Click to see Phil's homepage listing his workshops as well as pieces made by students. 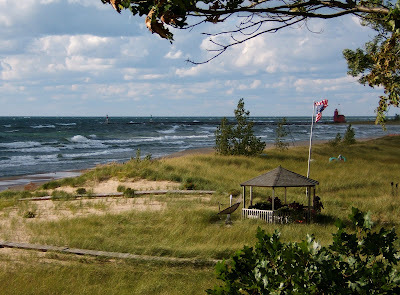 Recently there have been days with the wind blowing at speeds exceeding 30 miles per hour. 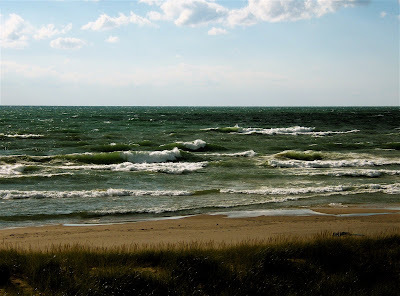 Consequently, we get wild waves rolling from far out in the lake to shore. I term these days as exuberant! Early in the morning I saw mainly greens and purples in the water. 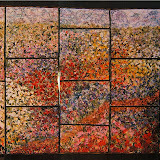 All my observations throughout the day are featured in the lake piece created that day. 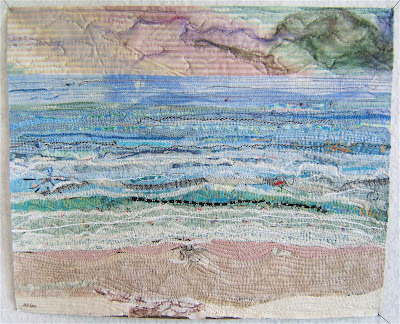 This is the first one I've portrayed the wave puddles on the beach. Most of them are temporary, sinking quickly into the sand. There had been a number of foggy mornings about a week ago when this lake piece was created. Around noon the sun breaks through to burn the fog off the lake. 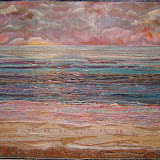 I love the point where the sun begins to highlight the crest of the waves and colors appear where all had been gray. 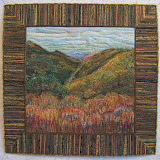 Lake #38 - 13"x 11 1/2"
My young artist friend who is also my niece-in-law, Diane Durand, was here last week with her family. 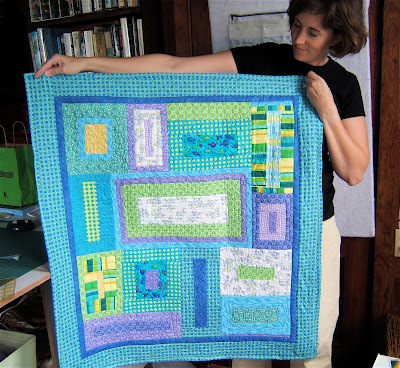 Her project in Studio North was to finish the quilt she had previously pieced for her second daughter who's expected to arrive in January. 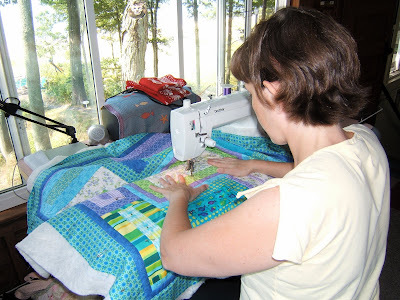 Diane had doodled a number of quilting patterns on a note pad. 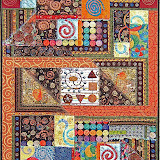 You may be able to see these quilting designs if you click on the photos below. She had pieced the back. 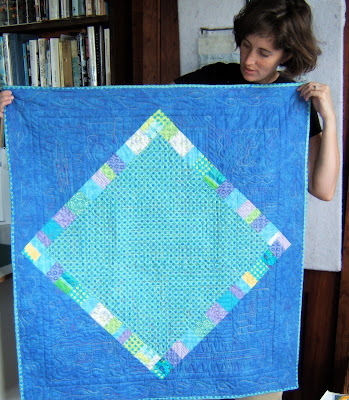 The quilt is a bit larger than the 45" width of the main blue fabric. 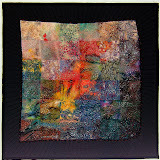 By cutting a diamond from a different fabric and then strip piecing the scraps left from the front of the quilt for a 1 1/2" wide inner border, there was plenty of fabric for the corner areas. It's become a two sided quilt. 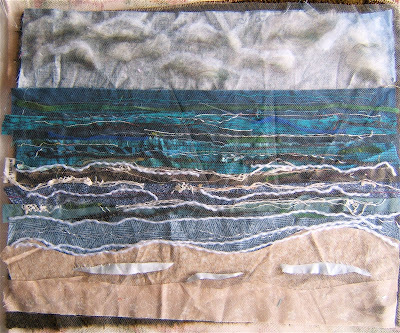 As Diane was piecing and trimming I was assembling another Lake piece. 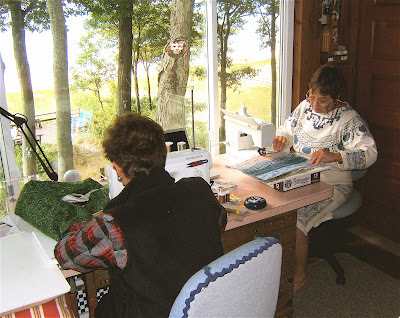 I was working at the same table she rotary cut pieces to size. 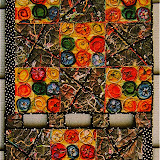 Many of her scraps ended up in this piece. The lake was very much like this on that day. 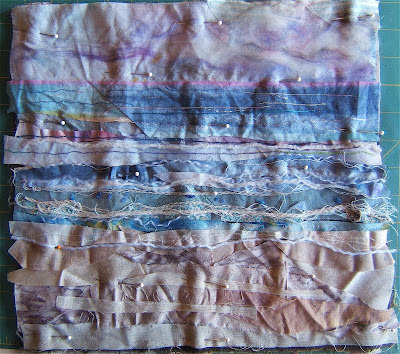 I especially liked the violet scraps (orts) and threads from Diane's project. 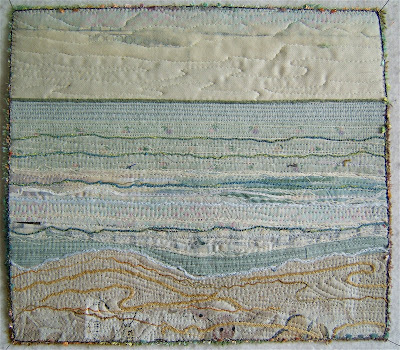 Lake #37 - 13"x 12"
To see more and read about Diane's work go here. 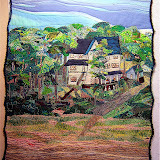 She has posted about her making the quilt top for Lucy, about the wedding present quilt * from me, as well as about her creations in my studio * several summers ago while on vacation.